The wooden house needs exterior trim. This statement will be approved by every professional builder and owner of a wooden house. In addition to decorative functions, the decoration also performs protective ones - a tree house is exposed to various dangers - the action of moisture, sunlight, and biological pests. 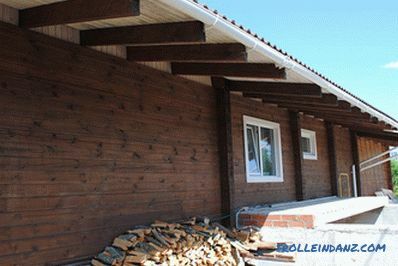 For the protection and decoration of buildings from logs and lumber, many different materials have been created, which are used almost equally widely and have found supporters both among the owners and among the builders of wooden houses. In this article we will talk about paints, how to paint a wooden house outside and why paint in many cases is preferable to other materials. For the analysis we take the most popular materials and compare them by the parameters that are most noticeable during operation. 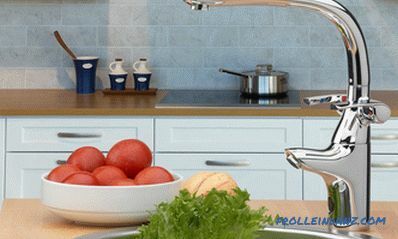 From the table you will see that paints for wooden facades are not a panacea for all occasions, but in many respects it is better and more practical than, for example, siding or ventilated facades made of porcelain stoneware. From the comparison it is clear that the most budgetary option is painting the walls and the rest of the wooden facade elements. 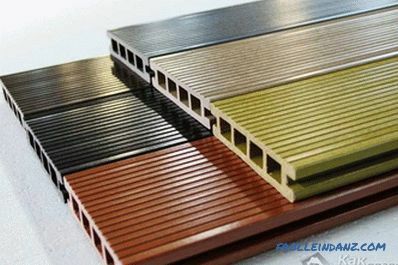 The paint is inferior in mechanical and fire prevention properties, for example, to porcelain stoneware or brick, but with the money that is saved when you buy material and the wages of professional builders, you can buy the most modern fire retardants that make wood absolutely non-combustible for several decades. According to the results of comparative analysis, you can make a choice in favor of paint. Now we must take another equally important decision - what paint to paint a wooden house outside. 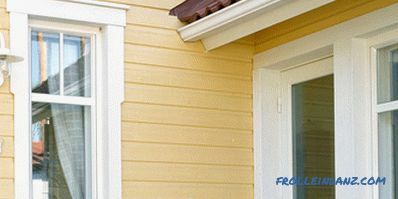 Manufacturers produce dozens of paintwork materials for exterior woodworking, but only some of them can be used for a wooden house. As for paint manufacturers, it is best to focus on well-known brands - Tikkurila, Dyuf, Finnkolor, Beckers any of the brands included in the Akzo Nobel concern. But you should buy them in large retail chains or well-known online stores. Unfortunately, there are a lot of fakes on the market and frank hack-work, therefore, deciding to save a few rubles, you risk to ruin your house and incur substantial financial losses - the alteration of poor-quality painting is a very laborious and expensive process. 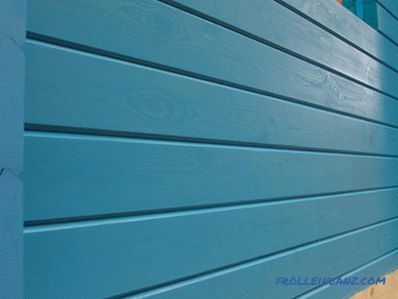 What paint is better to paint a wooden house outside can be found on the official websites of manufacturers, if there is no paint you offer, then you should not buy it, even at the most attractive price. Facade paints differ primarily in the composition of film-forming components. And the type of solvent, the possibility of tinting and other parameters depend on them. Antiseptic impregnations are often used to treat the walls of the house. They, too, can reasonably be considered full paints. Antiseptics are swelling and covering. Lessir antiseptics create a transparent coating that emphasizes the texture and color of the wood. Surface antiseptics create an opaque coating on the surface, but retain the wood relief. 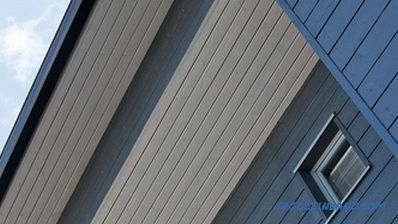 Antiseptics are very convenient for covering the facades of planed or polished wood of valuable varieties that have their own distinct pattern and beautiful texture. Antiseptics are good because they penetrate deep into an array of wood. Compounds dry out very quickly and in most cases for full protection it is enough to cover the wood with two layers of impregnation. But such processing can be performed only on a fresh tree that has not been painted before. Antiseptic impregnation should be repeated once every 2 - 3 years. But there are expensive tools that can be updated once every 5-6 years. As a rule, they belong to the category of azure or colored impregnations and, together with the protective one, perform a decorative role. The composition of many impregnations include substances that delay ultraviolet, the tree after such treatment does not darken and does not change color. The most fashionable and modern paints for exterior facades. Produced in the form of emulsions and dispersions, water-soluble. In most cases, acrylic resins or acrylic copolymers form the basis of such paints. 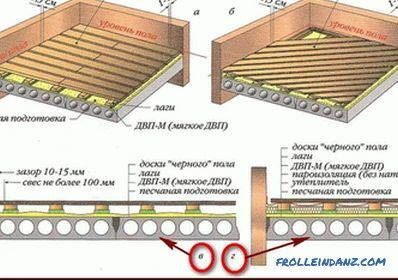 Artificial or natural rubbers, antiseptics and fungicides can be added to the components. They are sold as a white or transparent base with varying degrees of gloss - matte, glossy, semi-glossy. A number of pigments and dyes have been developed for acrylic paints with which they can be tinted to any desired color and shade.Some catalogs of dyes have up to 20,000 colors. But when buying such a paint, it is advisable to choose a pigment from a fan of colors from the same manufacturer. Most of the factories keep the chemical compositions of their paints in secret, therefore various reactions between products of different brands are possible. Of course, there will be no explosion, but the paint will dry for too long, blister or burn out quickly and change color. In order to avoid such "surprises", it is better to buy goods of one brand or check paint and pigment for compatibility. In most serious stores you will be prompted what you can mix with. Best of all right in the store and make tinting composition, it is especially convenient if there is a tinting machine and a color studio works. are environmentally friendly and non-allergenic. But they have a significant drawback - they are quite expensive, at least significantly more expensive than alkyd and oil ones. These are well-known compositions that have been used to paint wooden walls for many years. The paints created on the basis of polycondensation resins, united under the same name "alkyds", are distinguished by relatively low production cost, excellent coating ability, high level of adhesion to the tree. And you can paint as polished, planed or sawn tree, and logs, which are only removed bark. 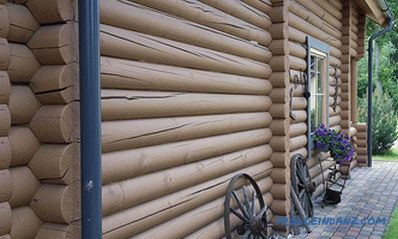 Alkyd paints form a dense and durable highly elastic film that responds very well to the temperature movements of wood and does not crack during drying, temperature expansion or other dimensional changes. 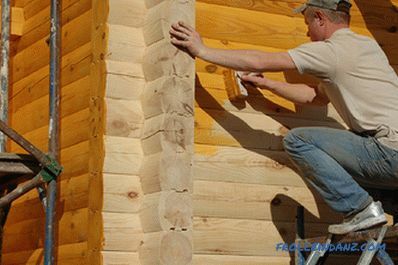 When coating wood in two layers, the film becomes waterproof and weakly vapor-permeable. Therefore, only dry wood is recommended to paint with alkyd paints. Some of the manufacturers include antiseptic and flame retardants in the composition of alkyd paints. It is necessary to learn about their presence from the instruction to a paint before its application. If there are no such components, then the walls need to be further processed before painting. This somewhat increases the cost of painting, but the life of the coating and the house as a whole increases several times. Alkyd paints are usually produced in a fixed range of colors, but changing the shade is quite simple - you need to mix two or more paints in a certain proportion so that the color changes in the right direction. The quality of the finish coating does not change. But, as in the case of acrylic, it is desirable to use only the paints of one manufacturer for mixing. In recent years, the world's leading manufacturers have been offering colorless alkyd paints that are tinted in the same way as acrylic paints. This is very convenient, especially when painting a new house, when there is an urgent need to paint a wooden house outside, so that it stands out among its neighbors, even those built according to the same project, which is often in cottage villages. Alkyd paints are a full-fledged acrylic competitor in quality. 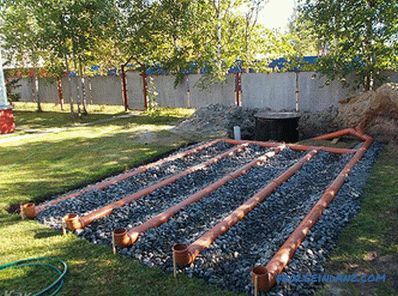 They lose only in fire safety, and then only during storage and work - here it is necessary to observe fairly strict rules of behavior with fire and heating devices. But after drying a layer of paint becomes almost non-flammable. However, due to fast drying, the paint does not have time to be deeply absorbed into the wood, which negatively affects its durability. Alkyd paints have good frost resistance and are able to withstand temperatures below - 30 0 C.
White paint, solvent, and similar weak organic solvents act as solvent paints on alkyd resins. They are moderately toxic and flammable, which also requires compliance with safety regulations at work. Although gasoline and kerosene also dilute alkyd paints well, but their use is undesirable - the color at the same time dims somewhat, and the luster can change towards increased haze. For a long time, oil formulations, of which linseed oil or other natural oils served as a diluent, were a serious competitor to alkyd. But in recent decades, an increasing number of manufacturers have abandoned them - paints are quite complex to use, dry for a long time and the characteristics of the finishing coating are inferior to most modern compositions. Despite its shortcomings, these paints are the most budgetary option. 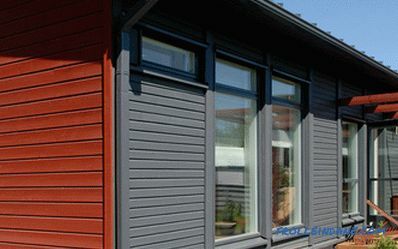 After application to wood, the paint is perfectly absorbed and creates a coating resistant to weathering. Recommendation one - if the old layer keeps well and is not covered with cracks and there are no visible film peelings on it , then you need to use the kind of paint that was used earlier. By oil paint, you can confidently apply alkyd - they are well combined. 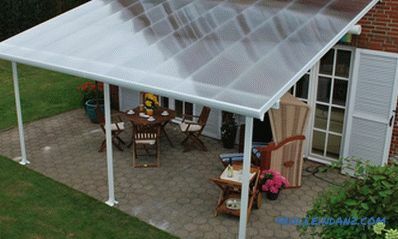 But acrylic is not suitable here, although some manufacturers allow such contact. 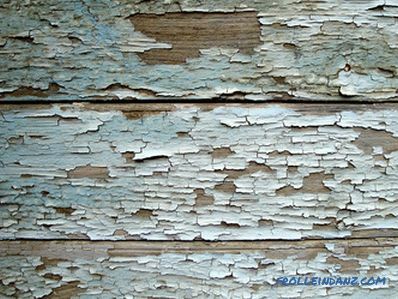 In the event that you do not know what type of paint was previously used to paint the house, it can be determined by the appearance of the old coating. If the old coating has a leathery surface and a bit of grind, then most likely, the house was previously painted with acrylic paint. Acrylic paint cracks along wood fibers. If you manage to roll a small piece of paint into a tube, then most likely you are dealing with acrylic paint. If, when coagulating, the shred of paint cracks, then most likely it is oil paint. Oil paint in the process of wear forms a mesh cracking. If the surface is covered with a glossy film of a relaxing antiseptic, then the surface can be repainted with the same antiseptic or an oil or alkyd paint. For repainting with acrylic paint, you will need to remove all the old antiseptic film to wood. Here, too, there are few recommendations - acrylic or alkyd paint, if the tree is of usual species, using varnish, or azure, if the finish is made of valuable wood with a good pattern. Priming is performed only if it is provided by the manufacturer. In any case, it is possible to paint the house outside only on a dry tree in warm weather, but not in direct sunlight. Any painting work on a wooden house should be done only when the wood is completely dry.